Are you an international reader who doesn’t consume your daily dose of CNN and Fox News, and therefore have no idea who or what this story is about? The basic gist is, you’ve got this church down there in Florida called the Dove World Outreach Center. The church plans, on September 11 (so, this upcoming Saturday), to burn copies of the Koran, the Muslim holy book, in order to teach “America’s enemies” that you cannot tell us what to do. 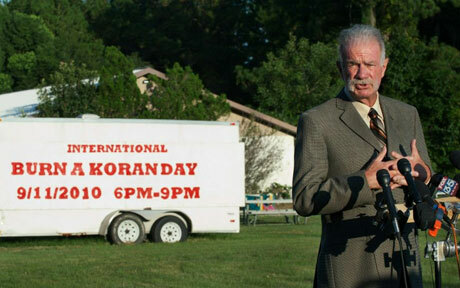 So, in order to teach these people a lesson, they’re going to burn copies of the Koran. Not only is it literally the stupidest thing I’ve ever heard of, but it’s remarkably dangerous. What better way to alienate America’s Muslim allies than by needlessly burning their holy book? What burning the Koran accomplish, besides filling hours and hours of TV time on cable news? But, whatever, that’s not really our charge here. I merely mention the story because of the Rackspace connection. Looks like that “Burn a Koran” day won’t be happening after all, which is surely a victory for common sense. But if we’re to believe the BBC—and why wouldn’t we?—the only reason the church agreed to cancel the book burning (I literally cannot believe it’s come to tech sites writing about mass book burnings) is because the people behind the Ground Zero Mosque have agreed to relocate the planned site.